This display package contains 26 pieces of gold plated crystal pendants and 26 pieces of silver plated crystal pendants, all come with plated chains. Total Jewelry = $287.00. Display Fixture (DSR12) with Header Card = $49.00. The cost of the display fixture is offset with $15.75 of wholesale merchandise. 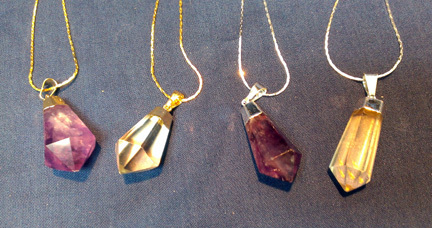 These pendants each contain a lovely 6 sided polished Amethyst or Quartz crystal point. Approximately 1"L X 1"W and comes with 18" gold or silver plated chain. 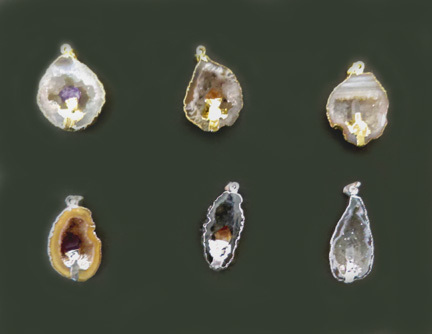 These pendants each contain a polished crystal point mounted in a gold or silver plated cap. Approximately 1"L X .5"W. These pendants come with 18" gold or silver plated chain and your choice of an Amethyst or Quartz point. These gorgeous Geode Halves each contain a piece of natural Tourmaline mounted inside. Approximately 1"L X 1/2"W. Comes with 18" gold or silver plated chain. 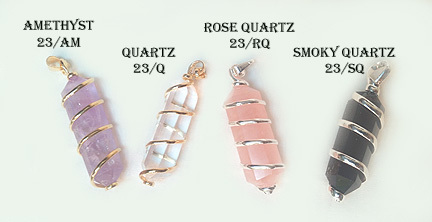 These pendants feature a rough Quartz Crystal Point with Pink & Green Tourmaline mounted on the front. Approximately 1"L X 1/2"W and comes with 18" gold or silver plated chain. These pendants feature a polished Quartz Crystal Point with Pink & Green Tourmaline mounted on the front. Sold by each. NEW STYLE!!! 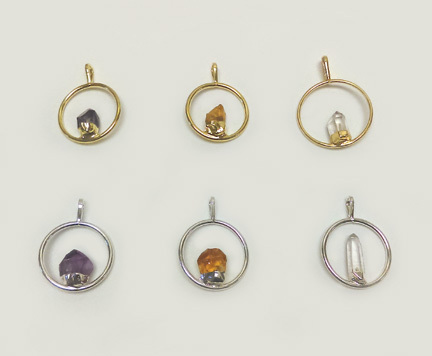 These spiral wrapped pendants each contain a polished Amethyst, Quartz, Rose Quartz, or Smoky Quartz crystal point. You may also choose an assortment of available styles! Approximately 1.5"L X .5"W. Comes with 18" gold or silver plated chain. Sold in bags of 100 each at $.05ea. We have a quantity of these Beige Earring Card that we are offering for sale. Card is made so it will hang on most jewelry displays. We are also offering a quantity discount. If you buy a 1,000 we will drop the price to $.04ea.